Do you want to see the main site of origin of Christianity as Armenia’s state religion ? Then visit Khor Virap which holds a special place in Armenian history as from this spot Christianity spread around Armenia. It’s the place where first Catholicons of Armenia Grigor Luisavorich (St. Gregory the Illuminator) was imprisoned for 13 years. He was locked in a deep pit by King Trdhat III as he was propagandaing Christianity in pagan Armenia. He stayed there 13 years until the king had proclaimed Christianity as its official religion and Gregory had been appointed as the first Catholicos (Patriarch) of the Armenian Church. 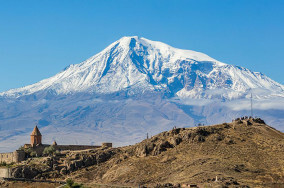 The dungeon of St. Khor Virap monastery is worth visiting not only for its significance and beauty but also because it is stunningly located in front of the massive Mount Ararat, the traditional resting place of Noah’s ark. Do you want to see one of the masterpieces of Armenian architecture, feel the harmony of Christian spirit and fabulous nature? If the answer is yes make your way to Noravank. Situated in the narrow gorge and surrounded by astounding red cliffs this monastery has become a must see destination. Though translated from Armenian Noravank means new monastery it was founded in the early 13th century and became the residence of bishops of the Syunik region. The site is comprised of three surviving churches, each decorated in intricate designs and religious beliefs. In 2002 the temple was included into UNESCO World Heritage Sites List. Take the chance to listen to the nature while looking at the manmade masterpiece and bear in mind that the way to get there offers great views! You will then have the opportunity to taste wine in Areni village which is considered to be the birthplace of wine as the oldest winery in the world has been uncovered here!